“Karate training is easy!” Now there’s a statement to get your head around. But is there any truth to it; is training in karate easy? Well, children, the unfit, the lazy, and folks of dubious character…all seem to have no problem being awarded a black belt in karate these days, so the training must be easy…right? Now there’s a statement to get your head around. But is there any truth to it; is training in karate easy? Well, children, the unfit, the lazy, and folks of dubious character…all seem to have no problem being awarded a black belt in karate these days, so the training must be easy…right? I’ll concede, some of the training might be easy (for you), but that’s not the same thing at all as karate training being easy. Everyone who goes to the dojo for long enough will come across aspects of karate training they find easier to deal with than others, which aspect(s) is down to any number of things, the type of person you are, your age, gender, health etc, and, your character. Of course, if you’re unfit or lazy, then almost everything beyond tying your belt around your waist is going to prove difficult, but that said, I think the majority of people training in karate (I’m talking about adults here), really do want to grasp something meaningful from the time and effort they put in at the dojo; and that’s the difficult part! For karate adheres to that age-old rule of life; you only get out of it what you’re prepared to put in. You can’t train with a shallow mind and still expect to go deep into your karate. There is a difference in how people train in karate, a difference that can lead to some confusion in those who believe they are doing what it takes to understand karate beyond the kicking and punching part. The Japanese word used most often for training is, renshu, although, less often, the word keiko is also used. Of the two, I prefer to think of the activity I’m undertaking in the dojo as keiko, why? Because even though both words are used to refer to karate training keiko suggests something different to renshu. Where renshu is made up of two kanji, the first pointing to the personal discipline required to capture the essence of karate, and the second meaning to learn, the kanji used to write the word keiko hold a different meaning. The first kanji in keiko, means to think about something, to consider what you have in front of you. The second kanji, means old, and is perhaps more recognizable to karateka as it is the same kanji found in kobudo. The meaning of keiko then, is to be mindful of that which has gone before you, the history of what you are involved in. It also suggests something more than merely mastering techniques in order to develop strong karate; with the word keiko, you are being asked to consider the history of the karate you’re learning and to preserve it, ready to hand it on to the next generation. Funakoshi sensei’s advice about looking to the past to know the future becomes a little less esoteric once you begin to appreciate the different kind of ‘thinking’ that goes along with the activity you are doing in the dojo. I’ve written many times about the importance of making sure that what you are doing in the dojo is the same as what you ‘think’ you are doing. For example, it’s no use thinking you are learning to fight, in a self-protection on the street kind of way, if the sparring you engage in is bound up in the rules of shobu-ippon, or you’re wearing enough protective clothing to keep you safe in a car crash. If you want to learn to fight on the street, and to deliver a powerful blow, you must also learn how to take one. I’ve seen many a tough guy brought to an abrupt halt by a well placed, and even accidental, strike to a vulnerable spot on the body. No amount of tournament sparring will equip you for the violence, ferocity, and fear encountered on the street. So, as I said, please make sure the karate training you are doing in the dojo is the same as the training you ‘think’ you are doing. With the notion of renshu comes the resolve to keep going in the face of sometimes great difficulty; but this can apply not only on the dojo floor, but just as well during those times when your enthusiasm for training is on the wane and you’d sooner sit in front of the TV instead of go into another winter’s night and face the cold floor of an unheated dojo. Whatever it is that threatens to stop you training, by overcoming it you are displaying your understanding of renshu. So, keiko or renshu…or, a balanced approach to your karate training taking into account elements of the two. Which is it for you? This kind of cultivation of your mind, through keiko, and your spirit, through renshu, should not be taken lightly, as strong and lasting karate is not possible in conjunction with a weak mind. The mind always comes first; and whatever your body does, it does so only because your mind allows it. If you think otherwise, try riding a bike at night and turn your head toward the stars while you contemplate the moon; now see how far you get! The unity between thought and action is as natural and necessary to your wellbeing as breathing and blinking, for, as involuntary as these two actions may seem there is in fact a little part of your brain making sure they happen. A poor sense of balance…when training in karate, or riding a bike, will always stop your progress. When you seek more from karate than mere fighting ability you open your mind to a lifetime of education and effort. 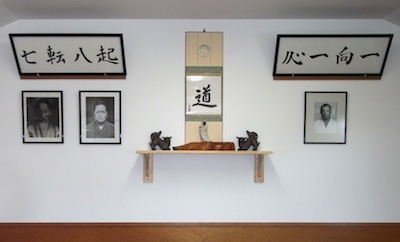 In the Jundokan dojo in Okinawa where I train there hangs a beautiful example of brushwork proclaiming the following advice: Kyu Do Mu Gen – Investigating the way is endless! Inherent in this statement is the need for personal research. For, at the appropriate time, to step out on your own and make progress through personal experiences is not only proper; it is essential. If your mind settles for too long in the information based, drip-feed, world of karate associations, rather than the experience lead world of personal investigation, you and your karate will stagnate. It is my firm belief that associations are set up to control karate first, provide an income for a select few second, and propagate the art almost as an after-thought; over the past thirty-seven years I have witnessed little in the activities of association, both great and small, to change my mind on that view. So, how do you study karate as opposed to just practice it? In truth the physical practice of karate is vital, your martial art must remain martial and for that you need to challenge your body and mind with conflict: but not always fighting. The conflict you engage in can also come through the kind of research you undertake. I often mention to the people I teach that the reason why someone is training in karate, whatever that might be, will dictate to a large degree the kind of training he or she will be willing to put him/her self through. Note I say, “Put them “self” through”. As their sensei I play only a minimal, guiding, role in a student’s search for karate, they make all the effort and they make their own choices too. Mistakes are made and learnt from, or not; either way, the journey they make with karate is theirs and theirs alone. Allow your sensei to hold your hand for too long and he will have no choice but to treat you like a child. All the training that takes place from beginner to shodan should not be confused for anything other than the preparation required for the training to come. Shodan, your first step, is a statement of preparedness, and the black belt, a mere symbol that you are now ready to learn. To see this stage in your karate education, as anything more significant is simply absurd, something I’m sure a great many of you reading this already appreciate. But after shodan, where to from there? Once the struggle to get the basics right has, to a large degree, been settled, what do you do to continue your education? Going deeper, through personal research and introspection has always supplied the answer to those with the courage to face the next phase of training in karate. If you have ever wondered why the dropout rate is so high at shodan, now you know. The reality for many is this, they never really wanted to study karate; they only wanted to be taught it.